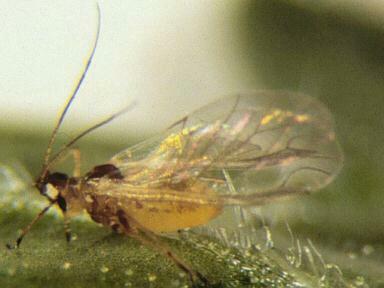 Aphids are a common pest in many kinds of plants. 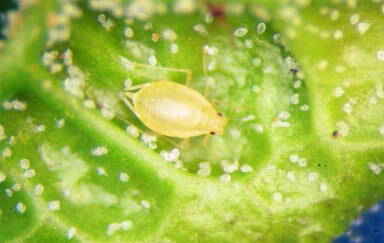 There are about 80 species of lice that depends for their food on foraging on plant cells. There are only 2 types of lice frequently found on Orchids These are the green peach aphid (Myzus persicae) and cotton aphid (Aphis possypii). 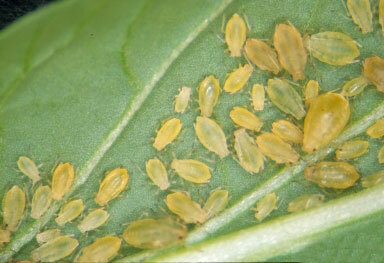 The damage lice cause stems from the damage of the cell by their snout which it extracts the cell saps. Because lice prefers the young and not yet developed leaves, (the cell walls of these are still very soft), the damage is even larger. The poked cells will not grow anymore, but the surrounding cells do. This creates curled and deformed leaves which sometimes crack. This makes the plant more susceptible to mold and bacteria. 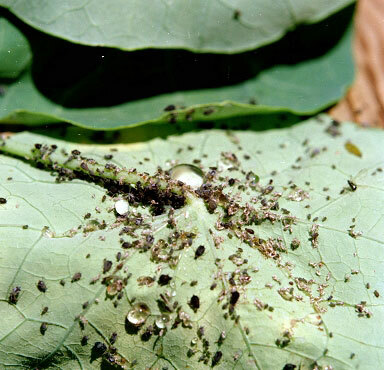 Another disadvantage is the fact that the lice leave their droppings on the leaves. These contain many sugars and this creates the so-called black spot. This prevents the leave to receive sunlight and eventually it dies. The life cycle of the louse has 6 stages. He starts with the egg or larval stage, then he becomes a louse nymph in 4 different stages and finally he reaches maturity. At this stage the animal gets wings so that it can search other hosts. All this happens in 7 days. In total, the louse can have 15-40 generations per year, in ideal conditions. Green soap with alcohol. 90 ml of alcohol 140 ml of water and 3 drops of detergent or soap. 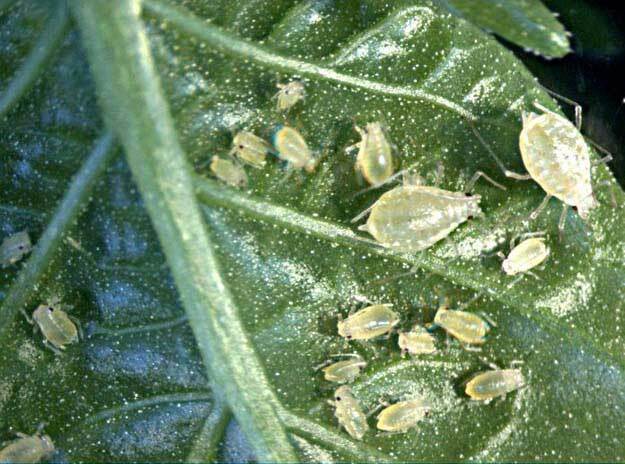 Shake well and spray on aphids. Pay attention to flowers as they can get develop spots when sprayed. 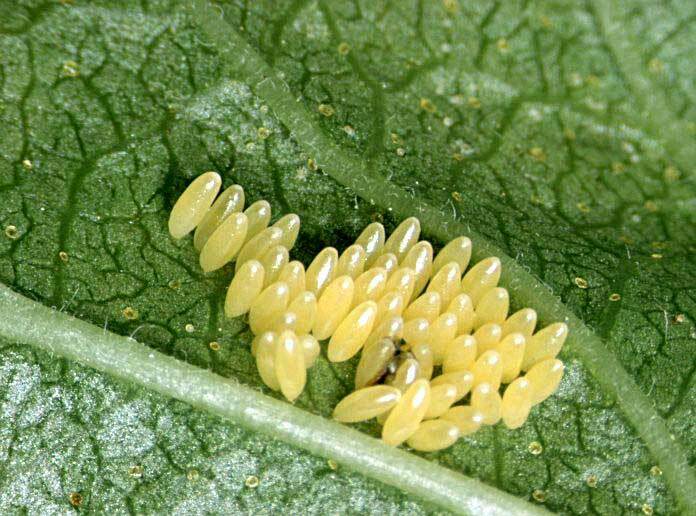 You can try to wash off the lice but remember that the eggs are glued and often at the underside of the leaf. Insecticides based on malathion, Acephate, diazinon and methiocarb. 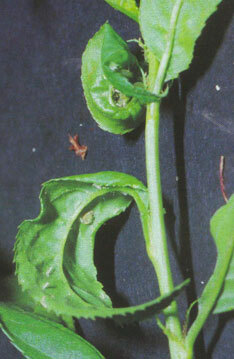 Insecticide spray on this basis is for sale in every garden center or plant shop. These agents often work very well. After 1 week the surviving eggs hatch so you can repeat the treatment if necessary. Lice can be fought with a variety of natural enemies. 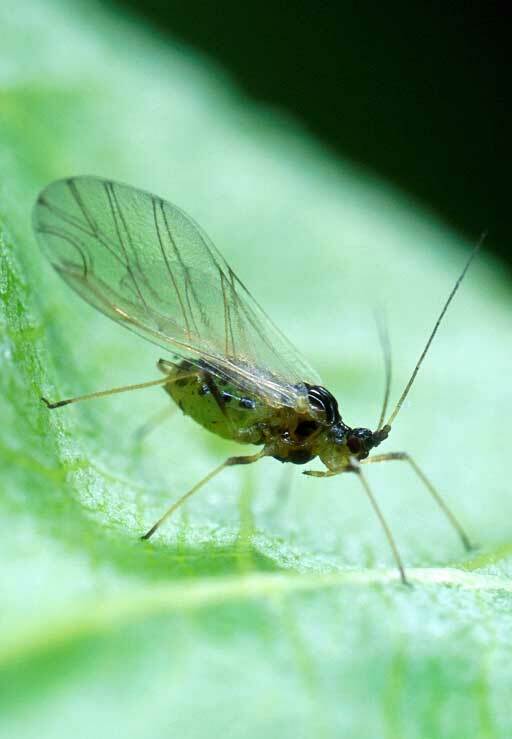 Ladybug is the most famous but there are lacewings and aphids mites, these consume up to 100 aphids per day. Natural control agents are (among others) available at Entocare.